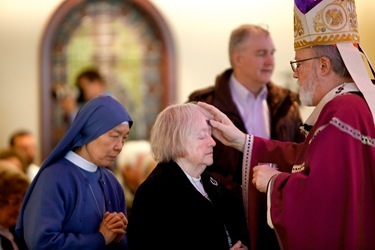 As we start the Holy Season of Lent this week, it is important that we try to use this period as a time to focus on our relationship with God and with others, and to draw closer to the Lord through availing ourselves of the Sacrament of Confession, acts of mortification and in general giving more time to prayer, reflection on the Word of God and fidelity to the Eucharist. 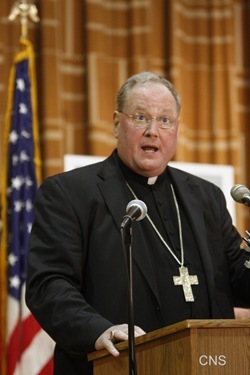 On Monday it was announced that the Holy Father had appointed Archbishop Timothy Dolan as the next Archbishop of New York. 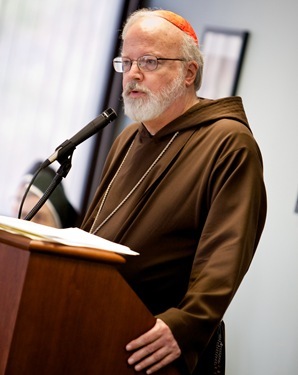 We join our prayers and best wishes to the millions of Catholics who rejoice at the news that Archbishop Dolan has been named the new shepherd of the Archdiocese of New York. He brings substantial experience, a winning personality and keen talent to this very important post in the life of the Church. 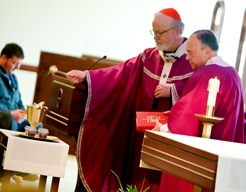 May the Lord bless Archbishop Dolan with much wisdom, good health and great joy in his service of God’s people. We had a wonderful conversation and I was able to say how happy I am for the people of New York. 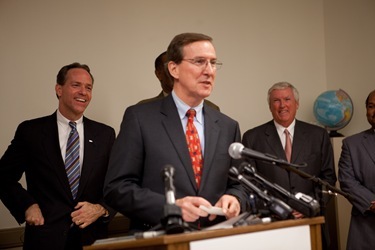 He said he is very much at peace with this assignment and looks forward to his new duties with enthusiasm. 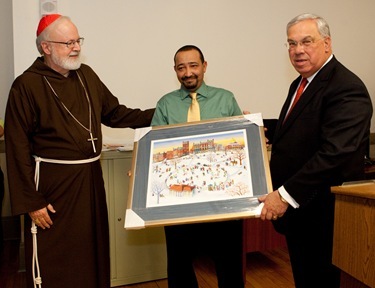 I assured him of my prayers and the prayers of the Catholics of Boston. This week I also had the opportunity to welcome the new president of the St. James Society. Father Kevin Hays, a priest of the Archdiocese of Chicago, has been with the Missionary Society of St. James the Apostle for about 12 years in Peru, and is replacing the society’s out-going president, Msgr. Finbar O’Leary. 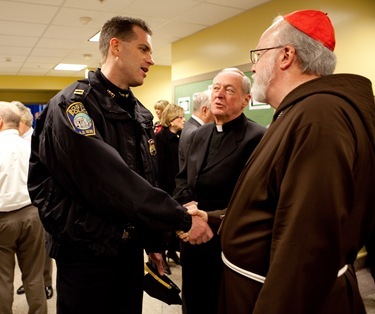 I would like to express our thanks to Msgr. O’Leary for his many years of service and wish him God Speed and blessings as he returns to Latin America. 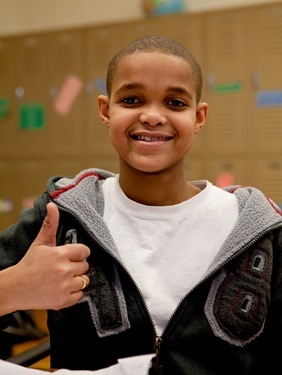 His goal is to establish L’Arche’s Communities there for adults with Down Syndrome and people with developmental disabilities. I’m sure this will be a unique and extraordinary contribution to the life of the Church in Latin America. I enjoyed meeting Father Hays who came to meet with me at the cathedral along with our own Bishop Robert Hennessey, who was a missionary in Bolivia for many years as a member of the St. James Society. The St. James Society was a Boston-born initiative, instituted by Cardinal Cushing. In the recent past I have invited United States’ bishops to allow their priests to be a part of the Society for missionary experience. Historically, Boston and Ireland have been the strongest participants, but today we are also getting a number of priests from England and other dioceses in the U.S. to participate as well. 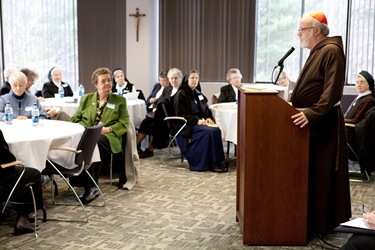 Last Friday I had the opportunity to visit with all of the major superiors of the communities of women religious serving in the archdiocese at the Pastoral Center. It was an opportunity to thank them for all of their work and for us to share information about the ministries and life of the different communities with each other. 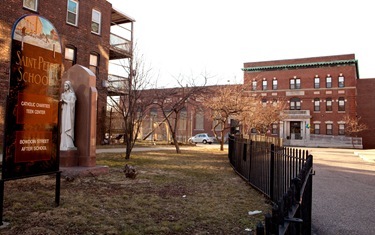 Among the sisters who made their reports was Sister Fanduca, from the Irmãs Franciscanas Imaculada Conceição, which is a small Cape Verdean community that has been working in the archdiocese for many years, both in Roxbury and in Brockton. We wish them many blessings, as this year is their 50th anniversary. We were happy that they were able to make their report; they made it in Portuguese and the sisters were all very supportive of them. 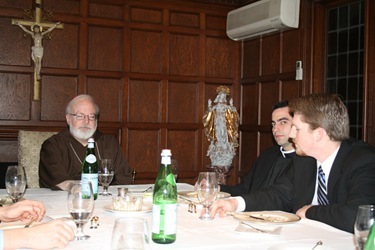 That evening we met with a small group of seminarians at the Cathedral, something we have been doing for some time now; we meet for Holy Hour and dinner followed by a time of conversation. 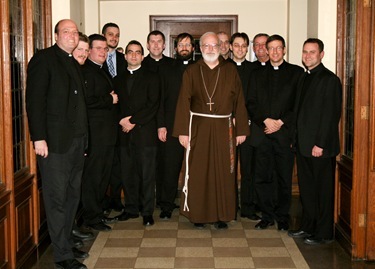 It has been a wonderful opportunity for me to get to know the seminarians better and to bring together those studying at St. John’s and Blessed John. It was a delightful evening. The rector of the cathedral, Father Kevin O’Leary, is always a very gracious host and we are very grateful for what he does to support these activities. 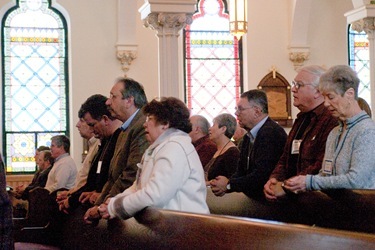 Saturday morning, we had the annual convocation of permanent deacons and their wives at St. Patrick’s in Stoneham. St. Patrick’s is such a beautiful venue and it was a magnificently sunny day. Father Bill Schmidt, the pastor there, has done an extraordinary job renovating the parish, and the music was very well executed, as always. 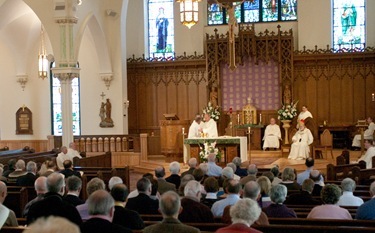 I celebrated Mass and then we had lunch with the deacons. 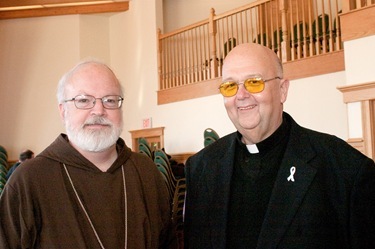 Father Joe Arsenault gave the keynote speech. He had been a permanent deacon here in the diocese for around 20 years after studying at Blessed John and was just was ordained into the priesthood last May. I also addressed the deacons after lunch, briefing them on the new initiatives taking place in the archdiocese. It was a nice day to be together with them and an opportunity for me to thank Deacon Leo Donoghue who is leaving his position as head of the Permanent Diaconate Office and also welcome Deacon Dan Burns who will take over for him. 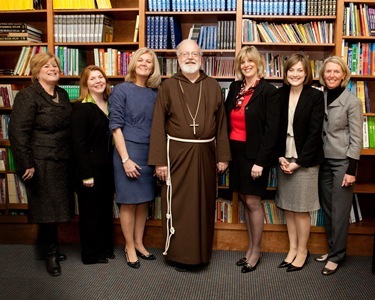 After the deacons’ convocation, I stopped by St. Mary’s in Dedham to visit Msgr. Thomas McDonnell who is very ill and had a wonderful conversation with him. 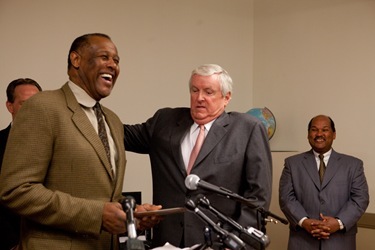 He is receiving very good care from the pastor there, Father Bill Williams, and all the priests and parish staff. Msgr. McDonnell is a great and prolific writer. 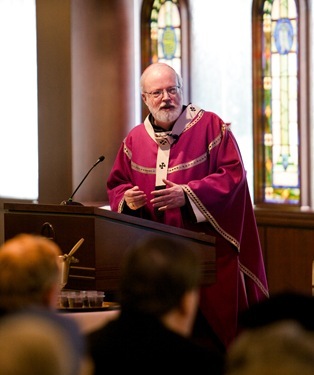 For years he has been writing beautiful spiritual reflections for The Pilot on Lent and Advent. I asked him if he had his next series ready and he told me he did. He also showed me a new apparatus that they brought him so that he can dictate to his computer. He is a brave man! 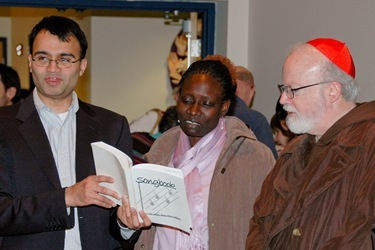 On Sunday we met at the MIT chapel with the local members of Communion and Liberation. The previous day had been the anniversary of the death of their founder, Don Luigi Giussani. Every year, around that date, Communion and Liberation members organize a Memorial Mass in the dioceses in which they’re working. 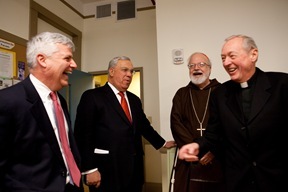 This year, we were invited by Father Richard Clancy to have the celebration together with the Sunday Mass celebration at MIT. 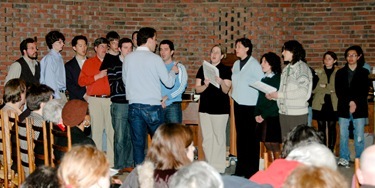 We are very blessed in the diocese to have members of the Priestly Fraternity of St. Charles Borromeo, which is the priests’ branch of CL; as well as the Memores Domini living in the North End, who are the consecrated laymen; as well as the people who belong to the movement — both married and single. In my homily, I quoted from the then-Cardinal Ratzinger’s homily at Don Giussani’s funeral Mass at the cathedral in Milan. 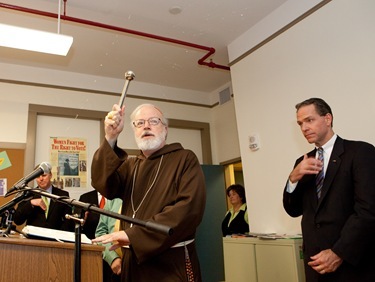 He was an extraordinary priest whose ministry to high school and college students blossomed into this ecclesial movement that has touched so many lives and given them the spirituality and energy for evangelization. It has been a great grace for the entire Church. 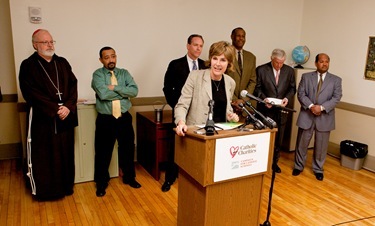 On Monday, I met with a number of local Jewish leaders and Holocaust Survivors who shared with us their concerns at recent developments that affect Catholic-Jewish relations, including the Holy Father’s lifting of the excommunication of Bishop Williamson, a lefebvrite bishop who made public comments minimizing the extent of the Holocaust. 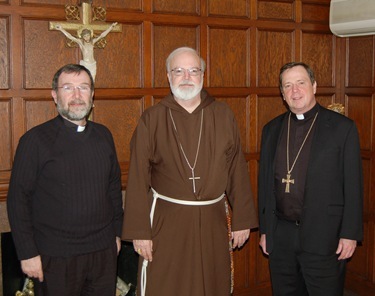 Father Ed O’Flaherty and Father David Michael from our Interreligious Affairs Office and Father Bryan Hehir accompanied me to the meeting. We met with representatives of the Jewish Community Relations Council, the Anti-Defamation League, the American Jewish Committee and other organizations. I was particularly impressed by the witness of two Holocaust survivors present, Israel Arbeiter and Steve Ross, who is the father of Steven Ross, the president of the Boston City Council. They spoke very eloquently of the horrors that they experienced on the death camps. The meeting gave me an opportunity to reassure them that the Catholic Church repudiates any attempt to minimize or deny the Holocaust. I also told them of our plans to move a Holocaust memorial menorah that is currently at the old chancery grounds in Brighton to the Pastoral Center in Braintree, and to have a rededication ceremony. The next day, I spoke with Cardinal Walter Kasper, who is the pope’s representative for issues related to interreligious dialogue with the Jews, and he gladly agreed to attend the rededication ceremony that will take place on the Feast of the Annunciation, March 25. At the meeting, I also mentioned that we look forward to the Holy Father’s upcoming visit to Israel in May as another opportunity for the Holy Father, on behalf of the Catholic Church, to assure people of our repudiation of these Holocaust denials and an opportunity to express, once again, the special relationship of friendship that exists between the Catholic Church and the Jewish people. 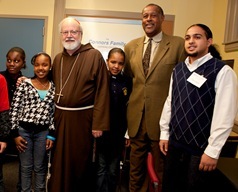 Tuesday was the reopening of Catholic Charities’ Teen Center at St. Peter’s in Dorchester. 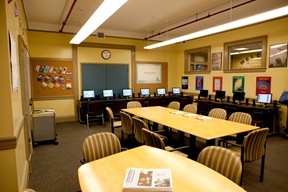 The Teen Center has been such a positive influence in that neighborhood and now — with the support of St. Peter’s Parish, Catholic Charities and The Catholic Schools Foundation, using resources and the support of the Yawkey Foundation — they were able to carry out these magnificent renovations for the young people there. I was delighted to see how many people attended the dedication ceremony, including quite a number of public officials and local area police officers. 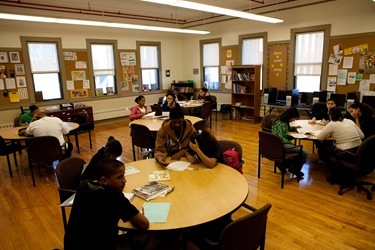 Their presence indicates what a precious institution the Teen Center has become in that neighborhood, particularly in dealing with the very serious problems of violence and the terrible history of teen violence there. 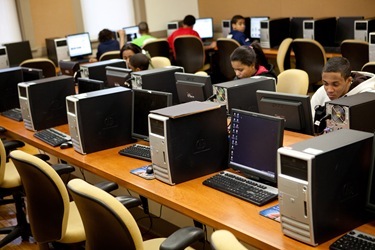 This center gives them the opportunity for recreational, cultural and educational services and also instills in them a sense of responsibility as the older teens help the younger ones. 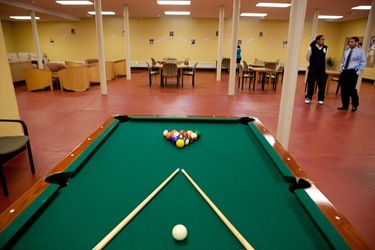 For years, the Teen Center at St. Peter’s has been a wonderful atmosphere where young people can come and feel safe and feel part of the community, providing support to them and truly a source of hope for these young people. 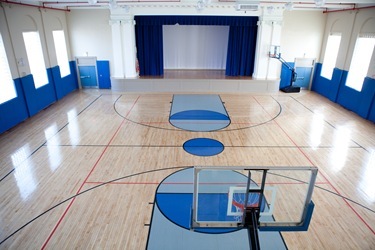 We are very grateful to everyone who contributed to making these renovations possible. I am very grateful for Brother Tino, Father Dan Finn, Paulo De Barros, Vivian Soper and all of those who have historically been so supportive of this very important work of the Church in that area of our city. 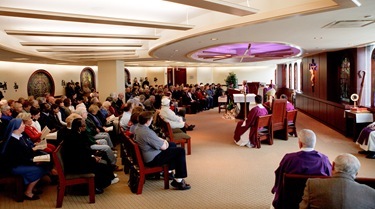 This Wednesday we celebrated Ash Wednesday at the Pastoral Center with a noon time Mass. 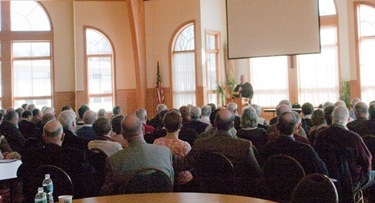 I was glad to see the chapel filled with staff and others who joined us for the event. 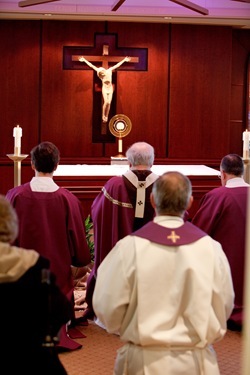 Lent is a very special time in the life of the Church and in the life of each Catholic. The fact that so many millions of people feel a need to present themselves for ashes, I think, is a sign of the hunger that people have for God. We must not allow our Lenten experience to be simply the ashes. That must be simply a recognition of our mortality and our dependence upon God. Our destiny to live with God forever and our life of the resurrection must begin now in our lives with discipleship, in the way we follow Christ into the desert for 40 days.